JOHN K. BUCKLYN. Providence. Quartermaster sergeant, Sept. 30. 1861; Second lieutenant, March I, 1862; first lieutenant, Dec. 31, 1862; commanded Battery E from May 15, 1863, to April 26, 1864, wounded at Fredericksburg, wounded severely at battle of Gettysburg, Pa, July 2, 1863; on detached service sixth corps artillery brigade as A: D. C. [Aide de Camp], and A. A. A. General [Assistant Aide of Adjutant-General] on Colonel Tompkins’ headquarters staff May 4. 1864; brevet captain, Oct. 19, 1864; captain in First Regiment Rhode Island Light Artillery, Jan. II, 1865; resigned Feb. 5, 1865, on account of ill health of wife. Battery E began its service at the effective start of the military campaigns of the Civil War, and only was mustered out (in June 1865) after the final battle of the war and the surrender of Robert E. L to Ulysses S. Grant at Appomattox Court House. During those four years the unit participated almost continuously in battles (45 of them!) , including the bloody battles of Bull Run, Fredericksburg, and Chancellorsville, At Gettysburg Lt. Bucklyn commanded the unit. The map above shows the position of Bucklyn’s battery during the Gettysburg battle. At Gettysburg, the 1st Rhode Island Artillery served as the artillery brigade for VI Army Corps, Army of the Potomac. Colonel Thompkins commanded that brigade of five artillery batteries. When Bucklyn returned to duty after his wounds from Gettysburg, Bucklyn was assigned to be the Assistant Aide of the Adjutant-General (AAAGen) on the staff of Colonel Thompkins. Bucklyn had the duty of reorganizing artillery batteries to fight as battle casualties broke down the effectiveness of a fighting unit or eliminated the unit’s commanding officers. The need to have an officer get into the front lines, to reorganize and recombine remnants of units, and issue new commands and battle orders on the spot, was important. The Colonel’s recommendation speaks of Bucklyn’s bravery and valor as the AAAGen during battles such as Cold Harbor and the Shenandoah Valley. JOHN K. BUCKLYN commanded Battery E from May 15, 1863, to April 26, 1864. We have an electronic copy of the entire 600 page history of Battery E during the Civil War. It describes the military history of the entire Battery including their daily activities, both in times of calm and also during the 45 (45!) battles in which they participated. If you are a Civil War buff, you will want to read this. The book is, we believe, in the public domain, and we maintain a complete electronic copy of the History of Battery E, First Rhode Island Infantry, here for you to read. 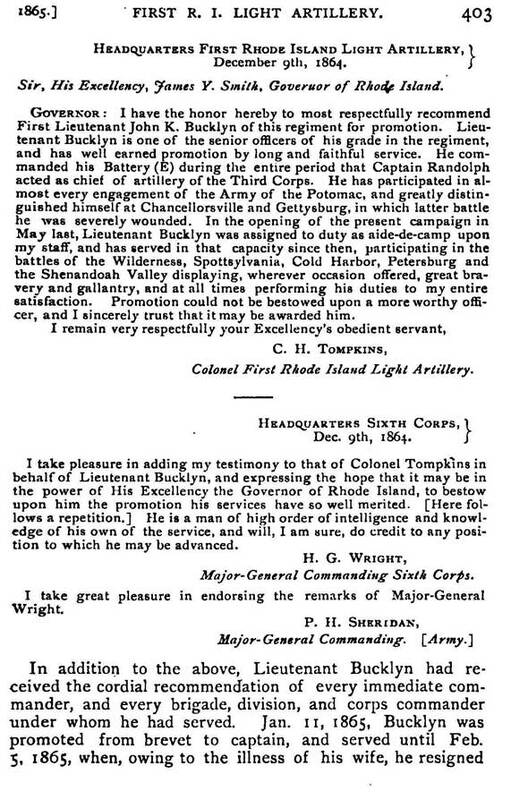 Bucklyn is mentioned in the following pages of the official history of Battery E of the First Regiment of Rhode Island Light Artillery. We have that history book available for you to see here. View pages 4 12, 30, 38, 43, 44, 47. 51, 66, 103, 108, 124. 134, 135, 147, 156, 162. 163, 169, 170, 171• 175, 177, 178, 180, 181, 194, 200, 205, 206, 208, 209, 212, 214, 215, 223, 229. 232, 233, 237, 241, 242, 246, 249, 25 1, 252, 254 257, 258, 261, 262, 272. 274. 276, 217,278, 279, 280, ;281, 369. 381 , 384. 392; 401, 437,471, 472,473,474.